Researchers using data from the Cassini mission, orbiting the planet Saturn, may have solved the mystery of why enormous storms erupt on Saturn every 30 years or so. 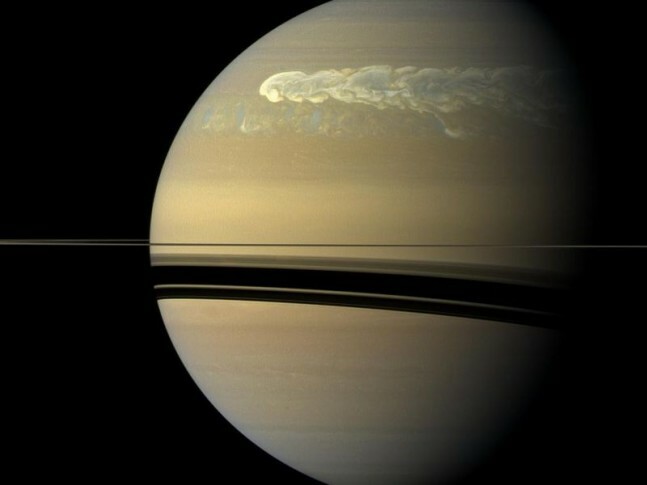 The researchers found that these storms, which form bright bands that can encircle Saturn, are on a natural timer – which is reset by each subsequent storm. 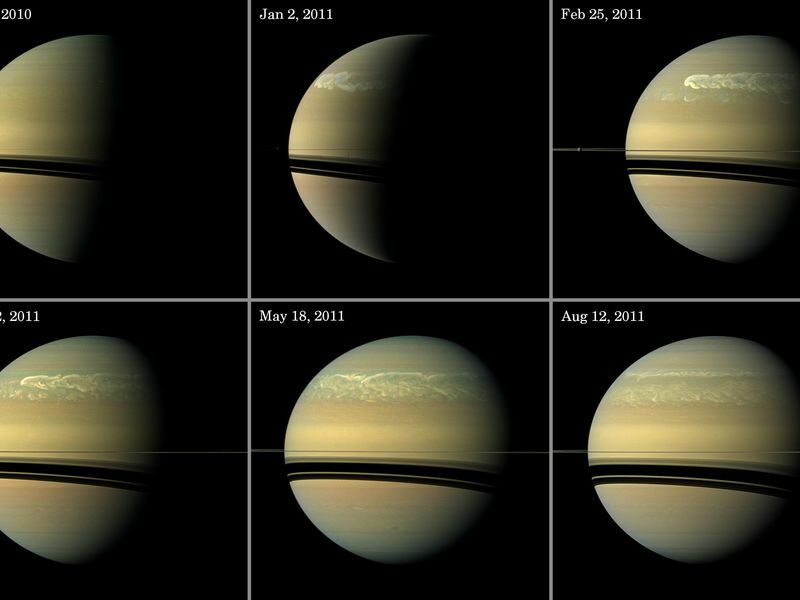 Six great storms have emerged on Saturn during 140 years of telescope observations. The most recent storm, which was tracked by Cassini and ground-based observers, began in December 2010 and continued until August 2011. The storm exploded through the clouds during that time, eventually encircling Saturn. Researches described the effect they believe is responsible for the effect in a paper published on Monday, April 13, in the online journal Nature Geoscience. Water vapor is heavier than the hydrogen and helium that make up most of Saturn’s atmosphere, so once a giant storm dumps its huge mass of water, the air within the clouds is lighter than the atmosphere below. This condition shuts down the process of convection, where warm moist air rises and dense cool air sinks, which creates new clouds and storms. This series of images from NASA’s Cassini spacecraft shows the development of the largest storm seen on the planet since 1990. Li believes that the episodic nature of the storms indicates that Saturn’s atmosphere may contain more water, relative to the other atmospheric constituents, than Jupiter. Saturn’s wetter interior may explain why the planet has such epic episodic storms unlike Jupiter, which has smaller, continuous storms. The findings are consistent with earlier observations that hinted at a wet interior for Jupiter. “Previous studies using spectroscopy have shown that Saturn’s interior is enriched in methane and other volatiles, by two or three times, compared to Jupiter. From there, it’s a short leap to expect that Saturn is also rich in oxygen, which is also a volatile and a big part of every H2O molecule,” said Andrew Ingersoll, a member of the Cassini science team, also at Caltech, who co-authored the paper with Li. Volatiles are elements and chemical compounds that change from solid to liquid or gas at relatively low temperatures. Researchers are interested in understanding the amount of oxygen and other volatile chemicals in the atmospheres of Jupiter and Saturn. These chemicals provide important information about the formation of the two planets, which are thought to have formed before all of the other planets in the Solar System. The Cassini spacecraft was launched atop a Titan IVB/Centaur rocket on October 15, 1997. The spacecraft completed its initial four-year mission to explore the Saturn System in 2008 and its first extended mission in 2010. Cassini is now on its second extended mission, which is scheduled to end in 2017.